"It will feel like a proper Devil May Cry." Capcom and Ninja Theory have presented a united front and promised that, in the wake of a fan backlash, the upcoming Devil May Cry reboot will still "feel" and "work" like old Devil May Cry games. Tameem Antoniades, co-founder of developer Ninja Theory (Heavenly Sword, Enslaved), said: "We've got our plan and we're not changing it." Antoniades was speaking at a Gamescom 2011 session watched by Eurogamer today. He went on to promise that DMC will "make sense" to fans "when you get your hands on it". "The people who are sceptical secretly want to like it," Antoniades added, "and our job is to prove it's Devil May Cry in essence." Fan backlash to Ninja Theory's Devil May Cry prequel began when a radical new look for hero Dante was revealed. Producer Alex Jones said Capcom Japan had been influential in this from the off. "It will feel like a proper Devil May Cry when you have the controller in your hand." "Character design is what Capcom Japan is deeply, deeply inolved with," said Jones. "[Ninja Theory and Capcom have had] dozens of meetings over character design". Tameem Antoniades went on to tackle the issue of frame rate. The Devil May Cry prequel will run at only 30 frames per second, whereas old Devil May Cry games opted for 60FPS. Antoniades said his game will be "locked" at 30FPS, and that the reduction allows his team to add "stuff like the world changing" - the way levels can transform dramatically during gameplay. 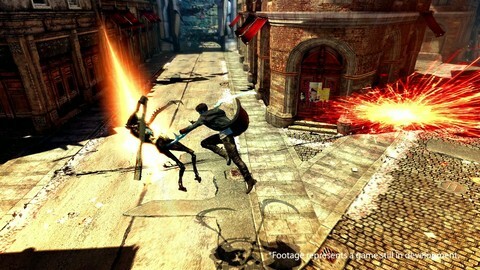 The director of the old Devil May Cry games will also work with Ninja Theory to ensure the "feel of 60FPS" remains. "It will feel like a proper Devil May Cry when you have the controller in your hand," insisted Antoniades. Combat was the focus of today's presentation, with the game played live in front of journalists for the first time. Eurogamer's Devil May Cry preview will be published tomorrow.